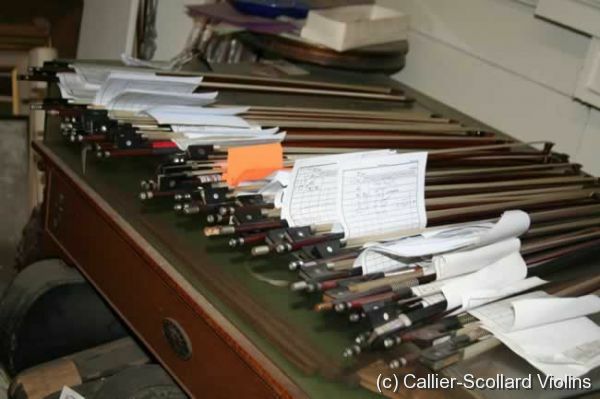 How much does it cost to rehair a violin bow? Just $ 22 if you leave it for one week. This allows me to schedule the bows that need rehairing evenly throughout the week and that saves you money. If needed I can rehair bows sooner that a week for an additional fee. Bow rehairing is a skill that takes practice. I usually rehair about three or more bows per day. The first step is removing the old hair. Please do not cut your old hair out of the bow before you take it to the shop. In order to get the ferrule (ring) off of the frog you may need to pull the old hairs out of the frog one by one. If you need to cut the hairs for some reason, please leave about 4" on each end of the bow. Once all of the blocks and wedge have been removed it's time to select the correct amount of hair for the bow. The stiffer the bow the more hair it needs, I usually like to start with about 15 extra hairs and then when the bow is finished I remove hairs one by one until I get the appropriate balance for that bow. I rehair bows frog first because the strongest part of the hair should be at the frog end because that's where most of the force from playing will be. Once the correct knot length is tied the frog block is put in. Then the wedge is fitted. At this point the hair is combed and slightly wetted. The length of the damp hair is measured and the hair is tied off. The reason you measure the hair when it's slightly damp is because then you don't need to take into account the ambient humidity because your measurement is always based on damp hair. The tip block is then replaced and the hair is slightly wetted, but you need to be careful not to get the hair wet near the wedge, otherwise it will wick under the wedge and the wedge will loosen up. Then the hair needs to dry for about an hour so the hair can stretch out and even up a little. 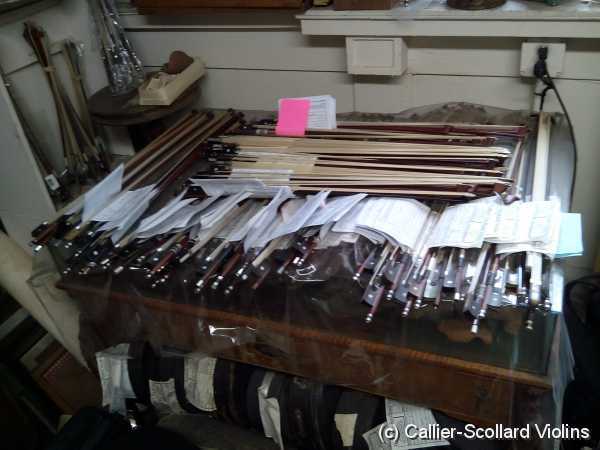 Violin Bow Rehairing is still $ 22 for one week service. Express service is extra depending on how soon you need the bow back. Same day bow reharing is available but by appointment only. Salt and pepper hair is $3 extra because it is hand mixed from pure white and pure black hair. It arrived last night. Very pleased with the results! Thank you! 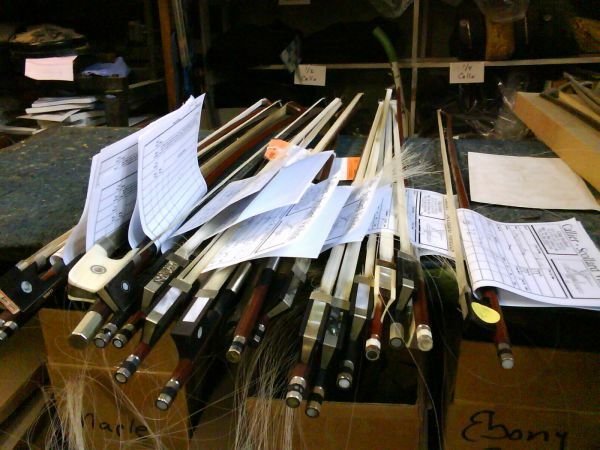 I would like a price on a special rehair job on a very beloved violin bow. I would like 50 percent white and 50 percent black hair. Also I like a balanced bow with half of each colour reversed in orientation so that the hair scales face both directions. I realize that this requires extra combing. It's too time consuming to not only mix the black and white hair but also switch the orientation of half the hairs. If you want to stop by my shop I'll give you half black and helf white hair then you can switch the direction of the hairs around. Just make sure that they are even at the strong end of the hair. There would not be any extra charge as long as you switched the hair. I just got the bow in the mail, looks great and is a terrific rehair. I appreciate it very much and your prices are terrific. Re-hair and grip here in New York city would cost at least $115! I have 200 students playing violin, viola, cello and bass. Needless to say I need some bows re-haired. 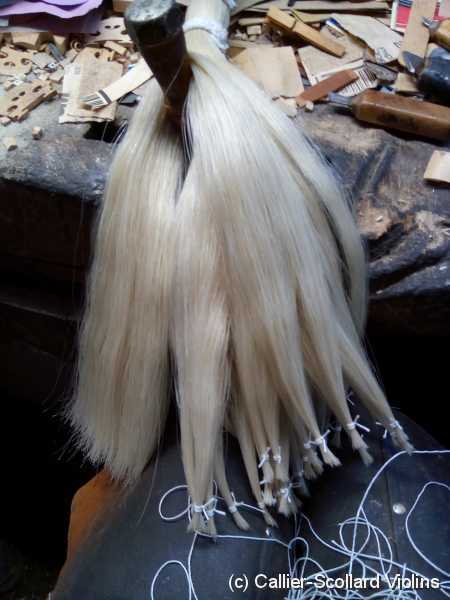 I've been reading about synthetic hair - have you ever used that? Supposedly it lasts a long time, plays and sounds wells and doesn't stretch. I hate the idea of just tossing out bows sticks instead of fixing them. Your prices are reasonable. I'd like to mail you a couple and see what we think. Occasionally customers have brought in synthetic hair and I have rehaired their bows. 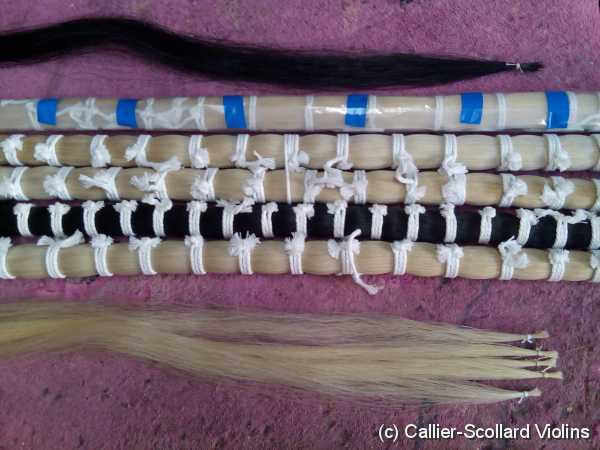 It's somewhat of a pain to work with because it does not have the normal stretch of real horsehair. I sent a bow to you to rehair and the USPS tracking # shows you received it a week ago. Please let me know when the bow can be sent back to me. Thanks! Thanks so much I received the bow at the same day you left me a voice message. Restring with colorful bow hair . I recently bought colorful bow hair and I am trying to find the right person to restring my cello bow for me. If you could contact me by emailing me back that would be fantastic. I need a few bows rehaired, and I live in South Carolina. Can I just send them to you UPS, or do I need to notify you first? You would be able to ship them back wouldn't you? I can return bows back by UPS if you include a return tag, Otherwise I return bows using Priority Mail USPS. If I mailed my bow, would you rehair it and mail it back to me? I live in Delaware. What would your shipping cost be? I live in Texas and our local here has stopped wanting to do too much work on classic vintage bows.. Thinks new bows better, but I like the wood of the old bows. How do I mail bows to you?? I just bought a nice bow marked Viorin. a Copy of course. It has good camber until you get to the tip . The tip is tuning to the right a little. Would you be able to straighten a tip? Most people use USPS Priority Mail. The bow can be straightened or more camber can be added. From your description it seems like the head of the bow is twisted. If that's the case, it can be heated and straightened so that the flat plane of the tip and the flat plane of the frog are parallel. I newly bought a full size violin, but I still keep my old bow. the roller at the end of it, which can tighten and loosen the hair, falls, and I can't find it. It also needs rehaired. Nicole, The bow nut can be easily replaced for a minimal cost especially if it's nickle, then it can be rehaired. Never before had I been told about the "salt N pepper" effect on the bow; mixing regular hair with black hairs - i decided to try it because he said the hair would break alot less - He was right! I'm so happy I was taught about that! that effect works great if you're playing pop music - say on an electric violin. He saved me LOTS of extra hairs being lost from my pop gigs! Thanks! I'll be coming back; and I always try and refer fellow musicians because his bow rehair price is the best in town! My bows arrived on Saturday. They look great and play well. Thanks so much. I put a check in the mail this morning. I like your website's 'layout' design---it is on a par with the best European professional ones! And I like the 'professionalism' and knowledgeable write-ups of your craftsmanship. 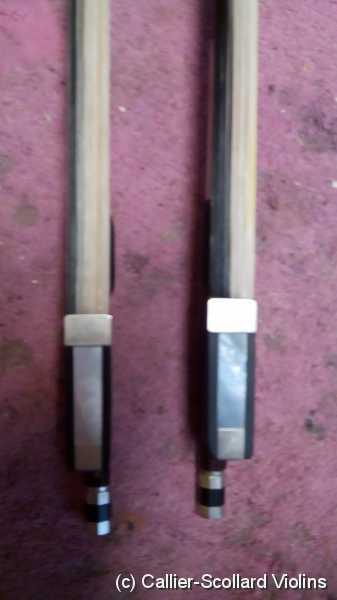 I came by three old violin bows---2 are 4/4 full length, one 3/4 length, but the ferrules are working 0kay. Can you 'quote' me on the cost of rehairing and postage to Ireland? Today I picked up my bow and was reminded that it has been two years since the last rehair job was done. The hair and workmanship remain outstanding and that's why I didn't need to come in until now. The bow plays just as I want it to with the new hair. Another perfect fit. No matter how far you travel to take your violin or bow to Craig Scollard, it's worth the trip and time.